John Kass’s latest article is part of today’s must reading. The main topic discussed in the article is the subject of offensive statues. Specifically, Kass wrote about toppling offensive statues and monuments. Kass then adds “You can’t say the Democratic Party wasn’t the slavery party. It’s historical fact.” The truth is that Robert Byrd, the long-time Senate Majority Leader and former leader of the KKK, and Albert Gore, Sr., the father of Vice President Gore, both filibustered the Civil Rights Act and the Voting Rights Act. They weren’t alone. This nation’s founding fathers didn’t envision the U.S. as a thin-skinned nation. They envisioned the U.S. as a nation of overcomers. The Party of the Perpetually Offended, aka the Democratic Party, aren’t overcomers. They’re a bunch of whiners who’d rather play the victim card than become part of the nation of overcomers. 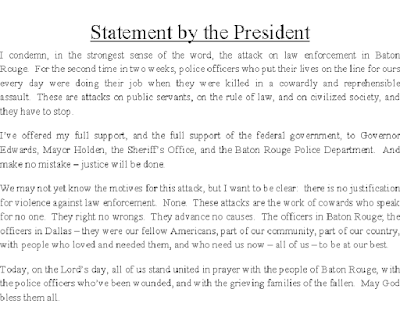 In the aftermath of this morning’s assassinations of 3 Baton Rouge police officers, half-hearted statements from the Commander-in-Chief aren’t enough. What’s required are strong actions that tell the world that assassinating cops won’t be tolerated. Right after Philando Castile, Gov. Dayton opined that Castile might still be alive if he were white. It was an ill-advised statement that Gov. Dayton never should’ve made. As long as it’s out there, though, it’s important that we flip this around. In light of the assassinations of the 5 DPD police officers last week and the assassinations of 3 police officers this morning in Baton Rouge and the I94 #BlackLivesMatter riots in St. Paul that left 21 officers injured, isn’t it time to ask whether #BlackLivesMatter should shoulder at least some of the blame for the assassinations of these police officers? Shouldn’t Jesse Jackson and Al Sharpton, especially Sharpton for his fiction of ‘Hands up, don’t shoot’ in Ferguson, be blamed for throwing white gas on a raging racial fire? This morning’s assassinations of 3 police officers breaks my heart, especially knowing that it was another black man that shot those police officers. While I won’t pretend that police officers always treat minorities the same way they treat whites, I won’t pretend that black leaders like Al Sharpton and #BlackLivesMatter haven’t stoked the fires of racial animosity, either. It’s time for the police officers across the nation to review their procedures. Likewise, it’s time that the black community realize that most officers think that their job is to protect and defend the people in their city. It was wrong for Gavin Long and Micah Johnson to murder in cold blood 8 police officers whose only sin was protecting people. It’s wrong for Al Sharpton to stoke the flames of racial animosity with chants of “Hands up, don’t shoot”. Frankly, it’s time that both sides worked together rather than fighting each other. 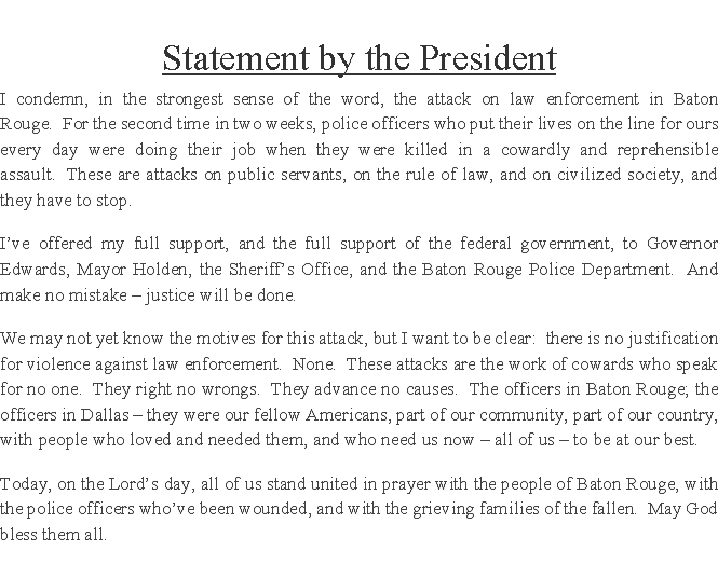 That’s a statement President Obama doesn’t want to give, which is why it’s a statement that won’t be released.